In humans there is a positive correlation between the pleasantness perception of soft skin stroking and the firing rate of unmyelinated C-low-threshold mechanoreceptive afferents (often abbreviated C-LTMR in animals and C-tactile and CT afferents in humans). CT-targeted touch reduces heat pain in humans suggesting that activation of the CT system modulates pain perception. This finding is supported by animal work which has shown that C-LTMRs inhibit nociceptive signaling at the spinal cord level, release a protein (TAFA4) with analgesic effects, and have positively reinforcing and anxiolytic behavioral effects. However, under pathophysiological conditions, research in mice and humans instead suggests a role for CLTMRs and CTs in tactile allodynia. 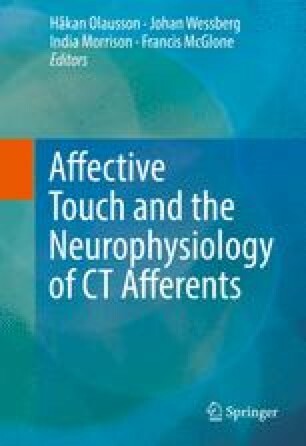 There is a divergence in results with some studies pointing to CLTMRs/CTs driving tactile allodynia, whereas others suggest a modulatory role.